Red Dog is a West Australian, a lovable friendly red kelpie who found widespread fame as a result of his habit of travelling all over Western Australia, hitching rides over thousands of miles, settling in places for months at a time and adopting new families before heading off again to the next destination and another family – sometimes returning to say hello years later. 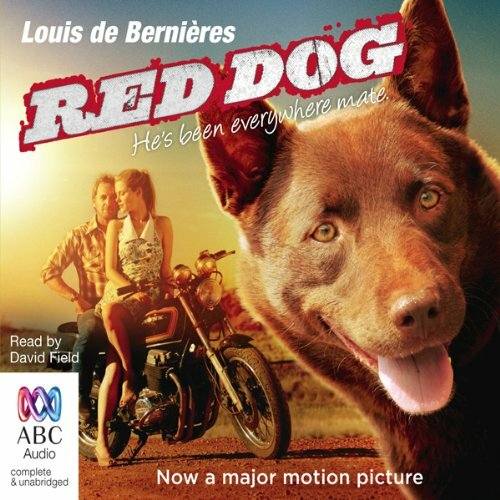 While visiting Australia, Louis de Bernières heard the legend of Red Dog and decided to do some research on this extraordinary story. After travelling to Western Australia and meeting countless people who'd known and loved Red Dog, Louis decided to spread Red Dog's fame a little further. The result is an utterly charming tale of an amazing dog with places to go and people to see. ©2002 Louis de Bernieres (P)2010 Associate Producer, Nelson Woss. Audiobook recording produced by ABC Audio. Ok story but the movie was more enjoyable. I still got a smile out of it. Amazing story full of real WA people and 1 super dog. I'm just happy to hear a story from the land I proudly call my home. Red Dog will always be important to me as the legend of the Pilbara, The legend of my home. Would you listen to Red Dog again? Why? A long drive in the car has always been preceded by this question, have you packed Red Dog? We want to listen to it again. It has been a family favourite for a long time with us. We love Red Dog, and we love the people who love him. He is part of our permanent cast of characters in the nurturing world of imagination and narrative. What about David Field’s performance did you like? David Field hits the right note of laconic friendliness that is Red Dog. This story will make you laugh and it will make you cry. All of us who saw the movie, preferred this story as a listening pleasure. Yes. Great expansion on a true story/outback legend. Very good writing makes the story come alive and fills in the blanks with very believable details. Makes the story really come alive. Which character – as performed by David Field – was your favorite? Although it was well narrated I felt that it was missing a bit of substance. I had to check if it was a children's book early on as nothing much seemed to happen in it. The fact that the author had pieced together stories of this dog's life from word of mouth stories. Which character – as performed by David Field – was your favourite? Could you see Red Dog being made into a movie or a TV series? Who would the stars be? I understand that it has been. Maybe it is better than the book. A bit of a disappointment for a book by this excellent author. I think I'll dig out Captain Correlli's Mandolin again for something a bit more engaging.